I hope you all had a fantastic time celebrating and that your 2014 started off well. January is a time to recover from the festive period in many way, including all the complicated cookery. So, I have something really simple for you today. If you’ve given up chocolate for the New Year (WHY?!?!?!?!?) then I’m afraid this one isn’t for you. I made these little chocolate discs for Christmas presents – you will have seen them if you read the last post – and I’ve had a couple of requests on how to make them so I thought I’d share on here. It’s less of a recipe and more just an idea because you can make them however you like! Also, they aren’t just for Christmas, these make great birthday presents or as little gifts to take to a dinner party. Firstly melt your chocolate, however you like. If you want to be snazzy and temper it then go ahead, I normally don’t bother with these! 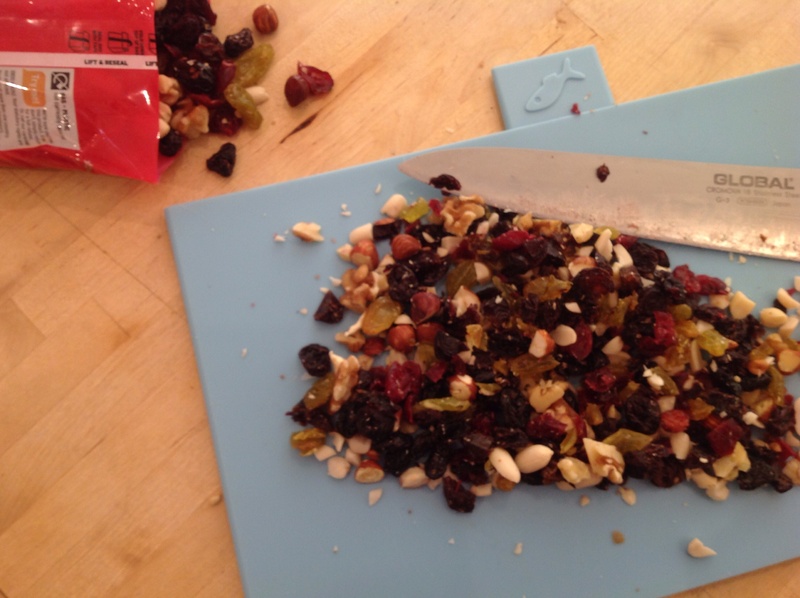 Then, Chop up your fruit and nuts to small chunks – it doesn’t matter if some are bigger than others, I think they look nicer this way. Take a spoon and use it to make little disc shapes on some baking paper, like giant chocolate buttons. Try not to make them too thick or they will take forever to set and they don’t look as nice. 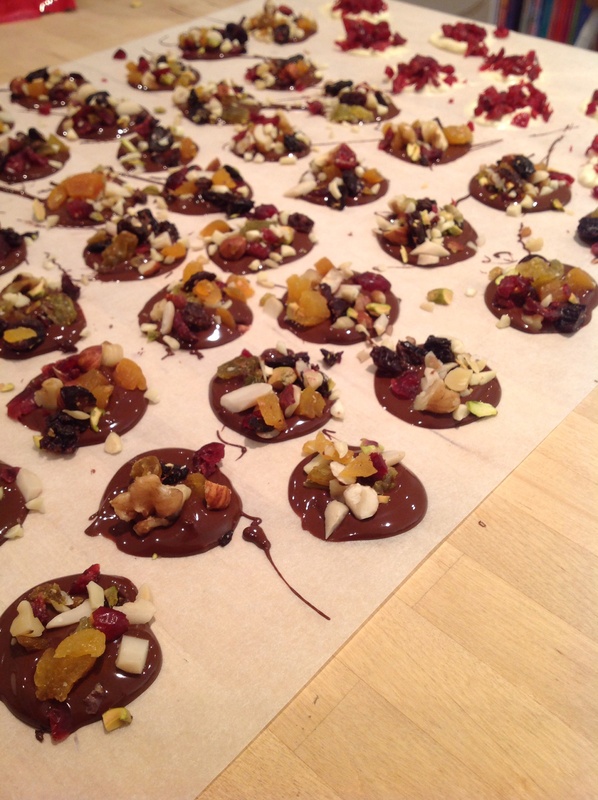 Whilst they are still wet the sprinkle on a generous amount of the fruit and nuts over each disc. Then leave them to set. You can do this either at room temperature or, if you are in a rush, in the fridge. Then just pack them into little boxes or bags and you’re ready to give someone a lovely little treat! Obviously I’ve just given you one option here but there are loads. If you use white chocolate then cranberries are a great option for topping and if you are making these for kids then you could use milk chocolate and simply add some colourful sprinkles or mini sweeties to make them look fun and even sweeter! The combinations are endless and you can make them to suit anyone and everyone. I hope you like this idea…let me know if you try them out and what combinations you go for! ← Après-festivities and a little plea.